Holidays don't need to be dangerous, they need to be celebrated! We have some pointers of things to watch out for so you and your favorite four-legged friend remain jolly! 1. Chocolate is everywhere during the holidays. Dogs are at risk for chocolate toxicity, which by itself is rarely fatal when treated. The darker and stronger chocolate put your pooch more at risk. 2. Ornaments, wrapping paper, ribbons, all things you'd think a dog wouldn't want to eat; however they do some silly things. Keep holiday decor up and out of the way! 3. 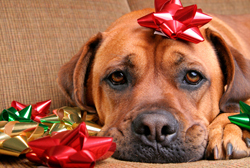 Poinsettia and mistletoe are mildly toxic for dogs! 4. Grapes or raisin indigestion may lead to fatal kidney failure, so remind your guests not to throw any to your dog! 5. Onions and garlic also are toxic for dogs, and can cause anemia! Holiday decorations that glitter with lights and sparkle symbolize the joyous spirit of the holiday season, but we must not forget the potential fire hazards that can be a tragic part of this time of celebration. Wisconsin residents, contact knowledgebroker Kori Cumley for fire safety tips or a quick quote on home and auto insurance.